This established kit allows the simultaneous analysis of vitamins A and E in serum/plasma in a single isocratic HPLC run with UV detection. An easy sample preparation is initiating the effective protein precipitation step. A stable internal standard is used for precise quantification. 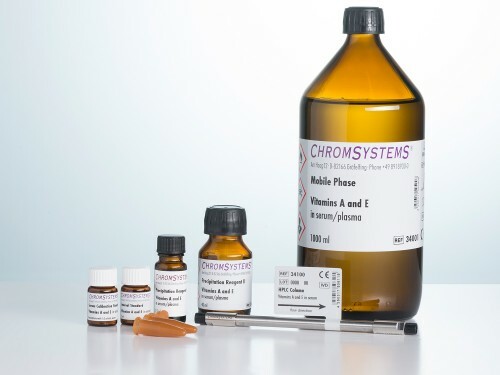 Chromsystems offers additional kits for the fast and efficient determination of vitamins A and E. You can choose between several options depending on the device capabilities (HPLC or UHPLC) and the sample quantities in your laboratory. Alternatively, the kit 34000/Premix with simplified sample preparation in premixed tubes is available, as well as the 34900/UHPLC kit for higher sample throughput and using UHPLC determination. 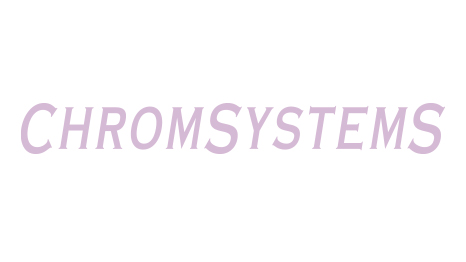 Our kits are also available with automated workflow (34700/F and 34900/F). Collect about 1 to 2 ml blood. Centrifugate 5 min at 2000 rpm. Store serum/plasma at -20 °C and protect from light until analysed. Pipette 200 µl serum/plasma + 20 µl Internal Standard + 25 µl Precipitation Reagent I into a light protected reaction vial. Add 400 µl Precipitation Reagent II. Centrifuge 10 min at 9000 x g.
Inject 50 µl of the supernatant into the HPLC system. Protect samples from light, at +2 to +8°C stable up to 12 hours. For longer storage periods (up to 3 weeks) keep samples frozen below -18 °C. For the analysis any isocratic HPLC system with UV detector is suitable. For simultaneous analysis of the vitamins A and E, a detector with programmable wavelength switching is very useful as these vitamins are detected at different wavelengths.